Save on Fosmon Controller Charging Dock for Xbox One at Amazon. [XBOX ONE CONTROLLER CHARGER] Say goodbye to AA batteries! 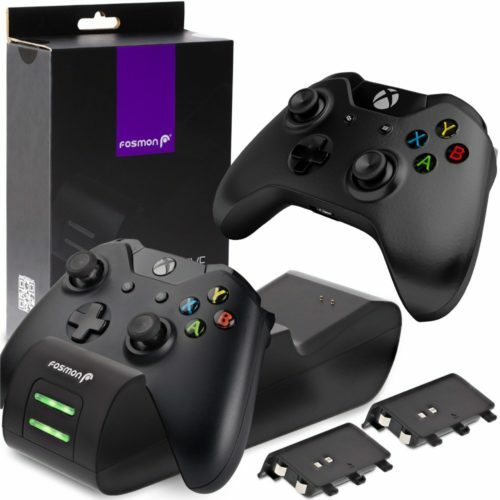 With Fosmon’s Xbox One controller charger you will no longer need to keep buying batteries for your controller. [COMPATIBLE WITH XBOX ONE / ONE S / ONE X CONTROLLERS] This controller charging station works for Xbox One / One S / One X controllers. [LONGER BATTERY LIFE] Fosmon’s Xbox One controller charging station’s 1000mah NiMH battery packs provide up to 30-33 hours of standby time. [EASY TO USE] When not gaming, simply put the equipped Xbox One Controller on the Charging Station and it will begin charging automatically without needing to remove the battery. The green LED indicator will blink when the controller is being charged, and stays lit to signal that charging is complete. [LIMITED LIFETIME WARRANTY] This product comes with a limited lifetime warranty. Please refer to Fosmon’s website for more information.